PlayShell Amphitheater – Artemis International Inc.
We make your dream playground a reality! 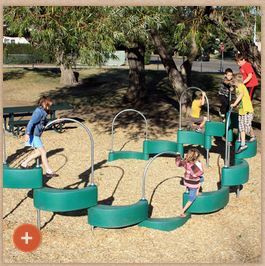 BigToys’ unique PlayShells are connected to offer seating for an outdoor classroom or a challenging linked climbing activity. We are your one stop shop National Playground Manufacturer. We can provide you with playground equipment, shades, shade structures, safety surfacing, trash cans, outdoor grills, bike racks, bleachers, picnic tables, benches , poured in place rubber surfacing, and artificial turf, all IPEMA & ASTM compliant . We have our own Certified and C.P.S.I installers who will do a professional, safe and beautiful job.